Contact Matt today at 760-533-0090 for a free review of your Lake San Marcos estate. We have multiple options to assist you in getting the most value out of your estate. We can conduct an online estate sale directly out of your Lake San Marcos home or business without having to move your items out. Our professional staff will photograph and catalog the entire estate at your location and publish the sale online. 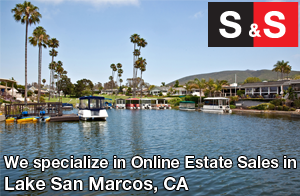 Your Lake San Marcos online estate sale will be "live" for around 7-14 days. During this time buyers will competitively bid on your valuables. Our professional staff will host an event near the end of the auction (usually on a weekend) where buyers come to your location to preview the estate similar to a traditional estate sale. Note that most buyers bid without attending the preview so the foot traffic through your home is lower than a traditional estate sale. After the close of the auction our staff hosts a final event where winning bidders pick up their items. At this time our shipping & delivery partners remove all items that need shipping or delivery. This is a turn-key model where we handle the entire Lake San Marcos estate sale from start to finish. Our online estate sale model has a proven track record of leaving very few (if any) unsold items at the end of the sale; this eliminates the problem of having to deal with items that didn't sell. We also bring to the table a large list of active buyers and dealers. Additionally, we market the event aggressively online and offline. In the end our clients benefit by receiving a larger check together with an itemized list of all sales. This model of estate liquidation is ideal if you have a large estate with valuable items. We are Lake San Marcos Estate buyers. We pay more money because we make more money. We've got the big trucks ready to go and the muscle to handle any job. We've partnered with professional movers that are licensed, insured, bonded and extra careful with your home. We are equipped to handle an entire estate buyout or a partial estate buyout. We buy Lake San Marcos estates, storage units, collections, Lake San Marcos hoarder houses and more. As part of our service we can remove (cleanout) all items leaving you with the peace of mind of an empty house. Contact Matt today at 760-533-0090 for a free review of your Lake San Marcos estate. Interested in buying estate treasures? We host San Diego Estate Sales Online all year round.